One for Potty Gardener ? Having tidied borders Cyril makes sure supplies still in the same place. Cyril is a real star. Great photo. ~he's a very chilled squirrel! Watch this space about April time !!! He is my favourite anyway Dawn..what a boy ! My fave squirrel pic BB, he is such a handsome little fellow.....can't wait till April! Thanks so much Janey..just hope he brings the little "twiglets to show us ! ~just been outside to make sure all the vents closed on the greenhouse etc and heard 2 foxes in the back lane just yards away from the wood~what a racket! Wow Arlene..are they mating..we never hear foxes !Not in the right place at the right time ! ~years ago BB my daughter went out at teatime with our dog at that time~she used to take a ball and play catch~she was quite a long time so we went out to look for her in different directions and I headed over to the cliffs. What a picture that must have been Arlene!.....did you find your daughter okay? ~yes she had gone further than usual, got tired and was sitting with the dog beside her when my son found her~she was fine but we were traumatised! Sounds like your dog was making sure she was safe Arlene.They seem to sense these things.Hope your boxers dont take to rolling in foxes pooh to hide their scent.The smell they return with is unmistakeable ! Our dog at the time had been owned by a pub landlady in Port Talbot and when she died her son didn't know what to do with him and was shutting him up in a shed during the day while he was chewing at the door to get out. He was pining and we had him' free to good home'~ he was terribly thin and all his ribs were showing~scared to take him out in case we were reported! My daughter was only 2 yrs old at the time and he was about 3 to 4. She used to ride on his back and play with him for hours~I am quite sure he would have protected her if necessary.He was 13 we think! when he died after he came in after a walk. When she was older he used to sit beside her when she played the cello! What a heartwarming story Arlene...he rewarded your rescue of him by a lifelong loyalty,which is priceless. One for me? Thank you BB!....great photo. Fantastic picture Bonkers. 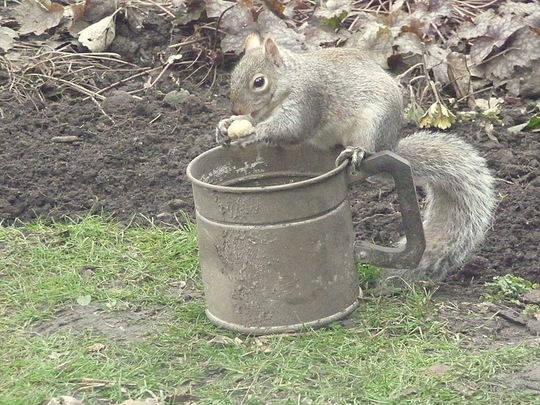 You sure he hasn't got anything else in that tankard. Arlene, I live in a road on a 1970's housing estate and we get foxes every night in the road beneath our bedroom. As you say they make a fair old racket. The main culprit is the vixen who usually gives a couple of staccato yelps every couple of minutes, this is while she is looking for a mate. The screaming you hear is either when they are mating or fighting. Thanks Sue ....yours is a looker too ! Toto...thanks...he is partial to the odd pint of guiness ! lol.Not aware of fox activity around here,but we do back onto woods,and have a visiting badger. great photo BB. my niece was feeding the ones in the park yesterday she was so excited. Yes Sandra..children can see beyond all the "issues " cant they..and just love the beauty of nature ! Dead right Bonkers. I'm proud to say that I have never grown up.